Imagine a multicultural, urban environment with a sunny climate that combines the best of nature: incredible hiking trails, pristine beaches, enchanting islands, and top-notch vineyards, all within a half-hour of the city center. This one-of-a-kind city is Auckland, New Zealand. Rich in Polynesian culture and a reputation for incredible food and wine, Auckland is a perfect metro destination with all the buzz of a world-class city with plenty of natural escapes. Known as the City of Sails because of its two harbors and most recently hosting the 2003 America’s Cup, Auckland is the largest city in New Zealand; however, it also has a secondary nickname—City of Volcanoes—because of its unique and fiery-geology. It is home to fifty volcanoes, some of which are still active. You can explore the highest volcanic cone, Mount Eden, for a beautiful view of the Viaduct Harbour, City Centre, Auckland Harbour Bridge, and the Hauraki Gulf. To understand its Maori culture, history, and art, take a stroll through the Auckland Museum in the City Centre. Get up close to artifacts and masterpieces that highlight the eight-hundred-year Polynesian history and showcase Maori traditions. As you make your way toward the harbor, you will stumble upon Chancery Square, which is full of designer boutiques. For lunch or dinner, meander through the Viaduct Harbour area, admire the sailing vessels, and stop to enjoy the best eating and drinking in Wynyard Quarter. With a recent face-lift from the 2011 World Rugby Cup, Wynyard has eclectic waterfront cafes, a fish market, many public plazas, and frequent community events. If your travels are during rugby season, do your best to attend or watch a match of the All Blacks. The Haka (Maori war dance) that the team performs is a must-see. 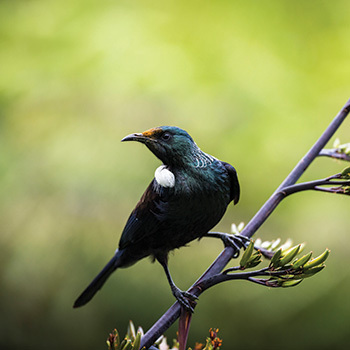 New Zealanders call themselves Kiwis after the flightless bird—the country’s unofficial emblem. Local currency is the New Zealand Dollar, also referred to as Kiwi. Local time is sixteen hours ahead of Eastern Standard Time in the United States. Cars are driven on the left-hand side of the road; look both ways before crossing. For those looking for adventure, Auckland has got you covered. 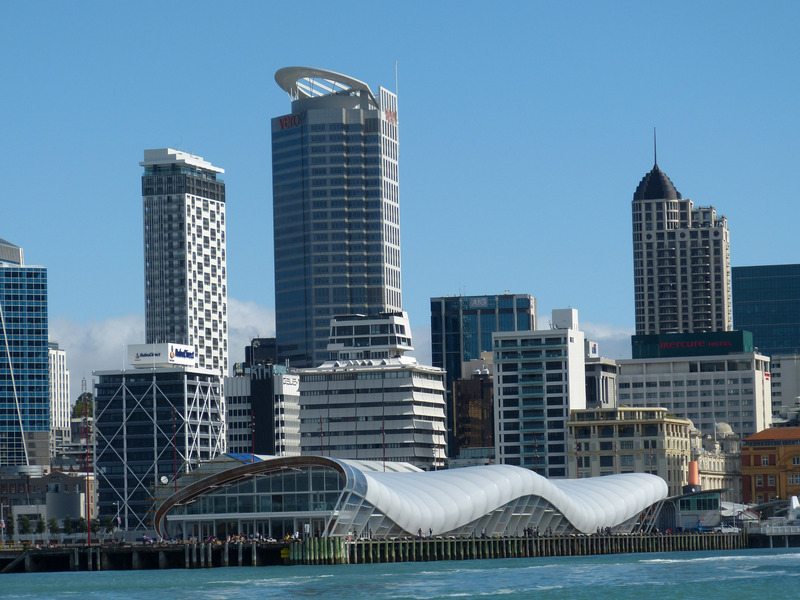 Right in downtown, you can stop in Auckland’s highest building, the Sky Tower. Test your limits by walking around its edges for a Skywalk or push your limits by jumping off the edge with its Skyjump. But, when in the country that invented bungee jumping, you may want to take the true plunge. 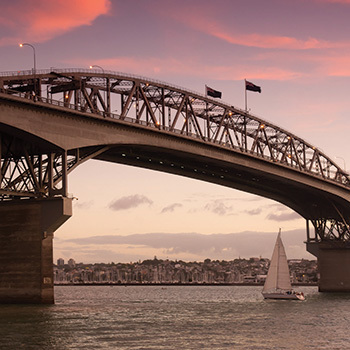 The Auckland Bridge Bungy is for thrill-seekers looking for an adrenaline high and view of Auckland like no other. Named after the famous Kiwi (nickname for New Zealander) who popularized the sport, AJ Hackett provides a 131-foot jump. Depending on your height and weight, you may be lucky to bungee and touch the water. Not ready to take the leap? AJ Hackett also provides guided bridge climbs for soft-adventure seekers. 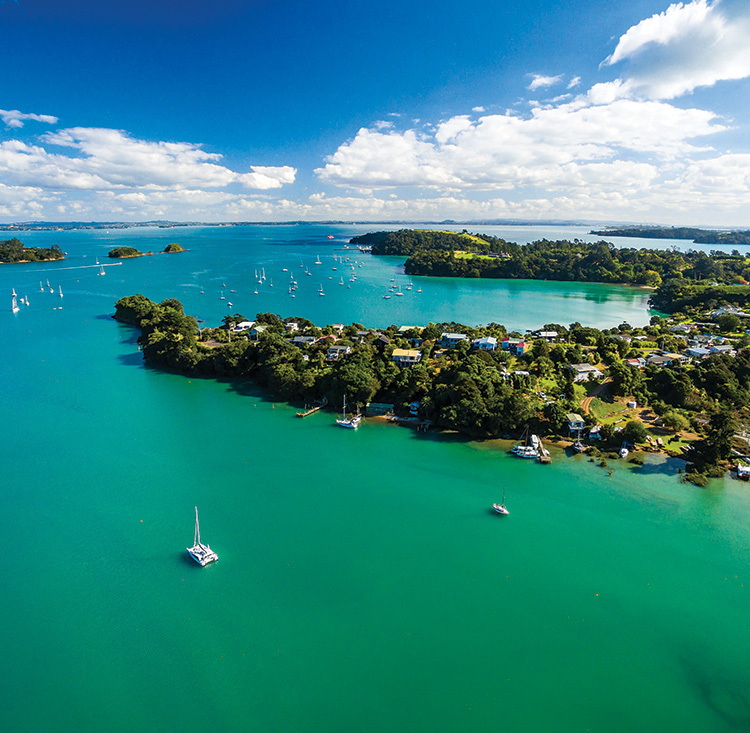 To see the beautiful waters of the Hauraki Gulf from another perspective, take an eco-safari to spot whales and dolphins or a short thirty-five-minute ferry to Waiheke Island. Waiheke Island is the perfect getaway for wine lovers, especially those who love rosé. Peruse the galleries near the harbor, but then head for a vineyard tour of the Mudbrick Vineyard and Restaurant, Tantalus Estate, or Stonyridge Vineyard. Upon your return to Auckland’s harbor, take a moment to appreciate the city skyline from another vantage point. Auckland has a unique blend of culture, history, natural wonders, and cuisine. Whether you’re a wine lover, adventure seeker, history buff, or marine-life enthusiast, you will fall in love with Auckland. Photography provided by (top) ©iStockphoto.com/stefaniedesign, (from left) ©iStockphoto.com/denizunlusu, ©iStockphoto.com/kokkai, ©iStockphoto.com/LucidSurf, ©iStockphoto.com/PhotoCPL.